There was joy for a number of Limerick establishments in the Munster Regional Final for the 2019 Irish Restaurant Awards which took place in the Limerick Strand Hotel. 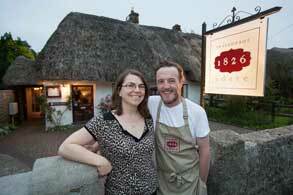 Wade Murphy of 1826 Adare was thrilled to take out the two biggest awards of Best Chef and Best Restaurant. “We’re really delighted about it,” Wade told the Limerick Leader, “It’s the sixth year in a row 1826 has won the best restaurant in Limerick award and that’s testament to all the hard work and effort from the team – past and present and everyone has contributed to putting 1826 where it is. “As for the chef award, I’m absolutely delighted, there are some great people cooking in Limerick at the moment and that makes it even better, but the best restaurant is one for the team and we’re always delighted and never take it for granted that we’re going to achieve it. Any plans for celebrations will however have to be put on the long finger. Indeed, so busy is Wade and the crew that he had to come back to work after picking up the awards to close the kitchen in his Adare eatery. “Plus we have a 10-month baby boy, so the time for celebrating is very slim,” he revealed. As always food is enhanced by the right drink and in the beverage department, Limerick again scored well as Adare Manor won Best Wine Experience and John Edward Joyce of The Mustard Seed at Echo Lodge was also in the winners’ enclosure. For general enquiries, information, website changes, or to request a listing on the website please fill-in the contact form below.